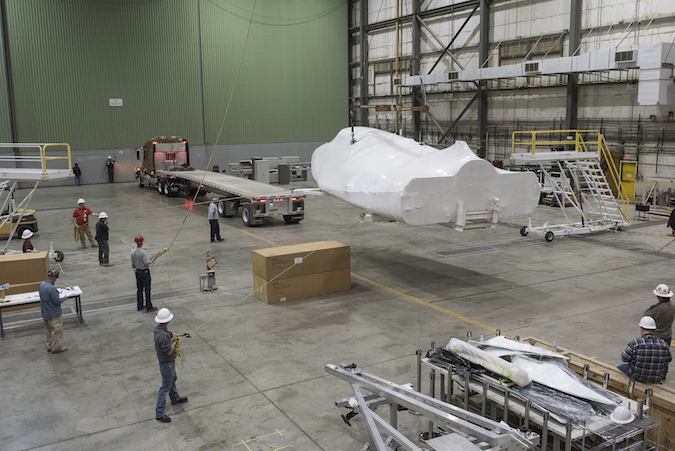 An atmospheric test model of Sierra Nevada’s Dream Chaser space plane is being readied for tow and landing tests at NASA’s Armstrong Flight Research Center in California this spring. The partially-assembled test craft arrived at the California test site, located on Edwards Air Force Base, on Jan. 25. Technicians are adding the ship’s V-shaped tail fins and other equipment before kicking off ground and flight tests in the coming months, according to Mark Sirangelo, corporate vice president of Sierra Nevada’s space systems division. The Dream Chaser spacecraft, originally envisioned to fly with astronaut crews, will now fly on space missions with cargo deliveries heading for the International Space Station. That change means the spaceship will return to Earth on autopilot, using navigation aids to descend to a runway, deploy its landing gear and touch down like NASA’s space shuttles. After the ground tests, Sirangelo said the Dream Chaser test article will perform “captive carry” tests suspended under a helicopter, using the exercises to verify the movements of the craft’s aerosurfaces and navigation instrumentation. “When that’s done, we’ll move into a series of flight tests, where it will be dropped for approach and landing like the shuttle Enterprise,” Sirangelo said, referring to the vehicle NASA used for landing demonstrations in the 1970s before the first full-up space shuttle mission. The Dream Chaser will be dropped from heavy-duty carrier helicopter for an autonomous landing at Runway 22L at Edwards Air Force Base. The test campaign in California’s Mojave Desert comes three-and-a-half years after Sierra Nevada’s Dream Chaser last flew on its own. A drop test in October 2013 ended with a crash landing after the ship’s left landing gear failed to deploy. Engineers blamed the mishap on a landing gear borrowed from a U.S. Air Force F-5E jet. Future Dream Chaser cargo missions to the space station will fly with a different landing gear, and the spaceship preparing for tests this spring in California features a gear more advanced then the suspect system at fault in 2013. “It’s much more close to the (configuration) of the orbital vehicle now, with flight software,” Sirangelo told Spaceflight Now. 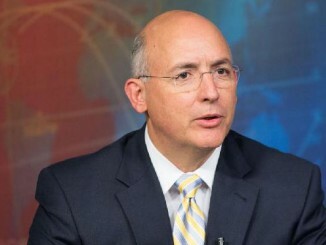 “It’s fully autonomous, so it will use flight software that we’ll go to orbit with. All the control surfaces, and all the data gathering is all electronic. In 2013, Sierra Nevada was competing with Boeing and SpaceX for lucrative contracts with NASA to carry astronauts to and from the International Space Station. The space agency awarded the crew transportation deals to the other two companies in 2014, leaving Dream Chaser’s future uncertain. But Sierra Nevada found other business for the lifting body space plane, primarily in the space station’s cargo resupply program. NASA announced in January 2016 that Sierra Nevada, SpaceX and Orbital ATK will be responsible for hauling up most of the space station’s U.S. cargo and experiments from 2019 through 2024, the station’s current planned retirement date. 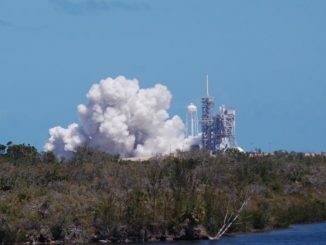 SpaceX and Orbital ATK are the incumbent commercial cargo transportation contractors, and Sierra Nevada will join them in the follow-on contract. Sierra Nevada also has agreements with the European Space Agency to study the use of Dream Chaser to provide access to space for European research experiments after the end of the space station program in the 2020s. 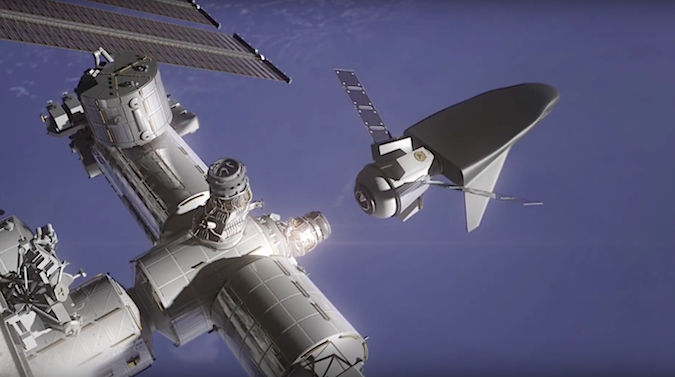 The United Nations agreed last year to purchase a standalone unpiloted Dream Chaser mission to Earth orbit in 2021 to host research payloads from developing nations. Sirangelo said the long gap between Dream Chaser flight tests was not only driven by technical concerns — like the upgrade and repair of the test craft — but by closing the business case for the program. The feeling among Sierra Nevada’s team is different this time, he said. Under the structure of the cargo resupply contract, each partner must pass several programmatic, safety and integration milestones before flying missions. Sierra Nevada has passed two of those milestones so far, Sirangelo said, and a preliminary design review for the full Dream Chaser system is coming up soon. NASA has not ordered resupply missions from any of the three providers under the new cargo contract — called Commercial Resupply Services-2 — but Sirangelo said the company hopes to get a firm order and a target launch date from the space agency this year. 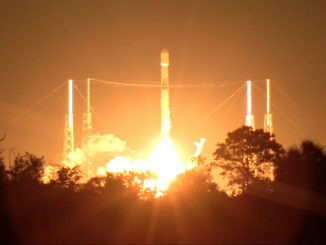 Each of the three CRS-2 contract winners is guaranteed at least six missions. On space station resupply runs, the Dream Chaser will take off from Florida on top of United Launch Alliance Atlas 5 rockets and return to runway landings at one of several potential sites, such as the Shuttle Landing Facility at the Kennedy Space Center, for unpacking, refurbishment and reuse. The Dream Chaser is about one-quarter the size of a space shuttle orbiter, allowing it to land on shorter runways. The fully-loaded spacecraft will weigh around 20 tons and will likely require the lift capacity of ULA’s most powerful Atlas 5 rocket configuration — the “551” with five strap-on solid rocket boosters and a 5-meter (17-foot) payload fairing, according to Sirangelo. The first space-rated Dream Chaser is “well under design and development” and on schedule, he said. Lockheed Martin built the Dream Chaser’s composite structure, and Sierra Nevada will locate the spaceship’s launch site processing facility alongside Lockheed Martin’s Orion production line inside the Neil Armstrong Operations and Checkout Building at the Kennedy Space Center in Florida.